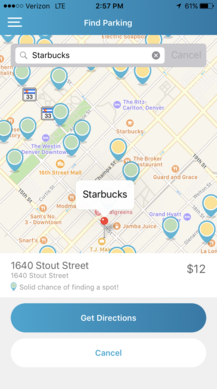 ParkiFi has come a long way since graduating from the 2014 Boomtown cohort and today it launched its user-friendly iOS and Android app aimed at reducing the stress and environmental impact of driving by directing users to open parking spots in garages and surface lots throughout downtown Denver. Approximately one out of three cars on the road in downtown Denver is looking for a parking spot and it takes an average of 15 minutes for drivers to find a spot to park. ParkiFi’s wireless parking sensor technology tracks when individual parking spots are occupied or available in real time. 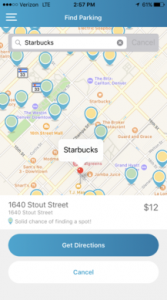 The app will roll out in other Denver neighborhoods and nationwide in 2017. Drivers simply input an address into the real-time parking map, and ParkiFi’s parking spot finder navigates them to open spaces. ParkiFi’s sensors detect when a car has parked at a ParkiFi-enabled spot. In early 2017, ParkiFi will launch automatic payment integration, metered parking availability, and dynamic spot re-routing capabilities, among other features. Since graduating from Boomtown, co-founders Ryan Sullivan and Rishi Malik have raised $13.5MM in venture capital to-date, including $9.5 million in Series A funding. ParkiFi is growing its parking inventory by 30 percent every month and has 529 parking sensors in downtown Denver, 1,318 parking sensors in Denver-Boulder and 2,403 sensors coast-to-coast. For more information on ParkiFi’s new app, click here.